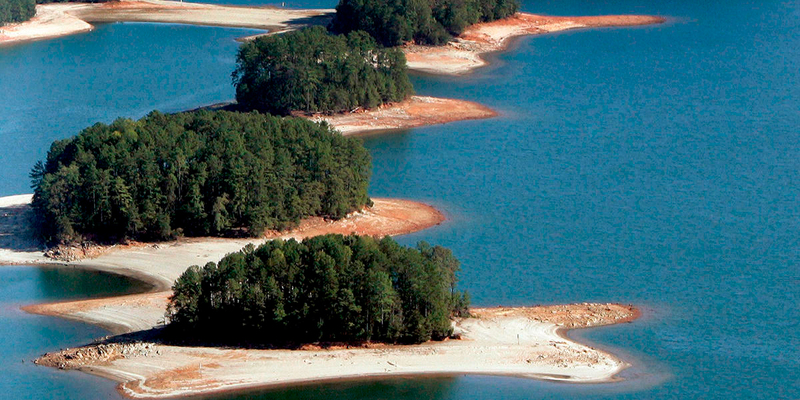 Drought conditions exposed Lake Lanier’s lake bed in 2007. The state of Florida is suing Georgia over water, including over how much water metro Atlanta can take from Lake Lanier. When the Supreme Court agreed to hear the case, officials expected it to take more than five years to be decided, but now, the case is expected to move much faster. States don’t sue other states that often. When they do, the case goes straight to the Supreme Court. So the process is different. The Supreme Court nominates a “special master” – someone like a retired judge, or a lawyer. That person does all the scheduling, and listens to all the arguments before the case goes before the Court itself. “Every special master comes to these cases and figures out the process and figures out the sequence,” explained Lewis Jones, a lawyer who’s represented the Atlanta Regional Commission in water cases. “It remains to be seen what this special master is going to want to do.” Jones was speaking to a North Georgia Metropolitan Water Board meeting. In this case, the special master is Ralph Lancaster, an attorney from Maine, who has served in this role three times before, and is the only person to ever be chosen by the Supreme Court to do it a fourth time. One impact from that, she said, will be on the cost. Once the special master has heard all the arguments, he makes a recommendation to the Supreme Court. The justices can go along with that recommendation, or make another decision. Whatever they decide, Gil Rogers, a lawyer with the Southern Environmental Law Center, said he thinks it won’t be the end of the water wars. The next deadline in this case is Feb. 2, 2015, when Georgia’s response to Florida’s complaint is due.